We’d love your help. Let us know what’s wrong with this preview of The Death Messenger by Henry Taba. 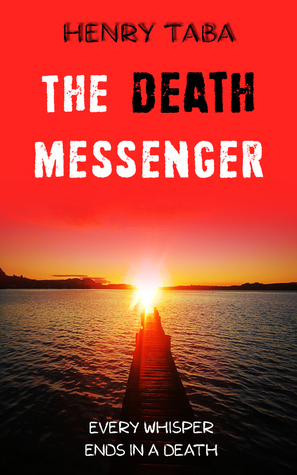 To ask other readers questions about The Death Messenger, please sign up. The Death Messenger is a combination of genres; supernatural, thriller, horror, mystery, and a bit of fantasy. Each element in the story helps bring the plot together and adds an extra layer of excitement. There’s a darkness to this book that I thought was the most attractive part of the story; hearing whispers of when death would come and claim the lives of the people around you can make for quite an adventure, am I right? That’s exactly what happens to our protagonist, Westcliffe Patel, after The Death Messenger is a combination of genres; supernatural, thriller, horror, mystery, and a bit of fantasy. Each element in the story helps bring the plot together and adds an extra layer of excitement. There’s a darkness to this book that I thought was the most attractive part of the story; hearing whispers of when death would come and claim the lives of the people around you can make for quite an adventure, am I right? That’s exactly what happens to our protagonist, Westcliffe Patel, after experiencing a tragic car accident. Originally, he assumes he’s suffering lingering symptoms of his ordeal or maybe he’s going crazy. But as time passes, and one of Westcliffe’s friends loses his life, the hero of this story quickly realizes he is not imagining things. The plot for this book is interesting and takes an even greater turn when Westcliffe’s girlfriend gets involved and we realize her life may also be in danger. How can you fight the whispers in your head? What is the shape of evil? These are questions that are asked to readers as you dive into this journey. Overall, I think this book had all the right elements lined up to make a great story; romance, dark psychological themes, death, suspense, even a bit of mystery. I would certainly recommend it to others, especially if you enjoy dark fiction and thrillers, but I think I should be fair in admitting The Death Messenger unfortunately falls victim to poor editing. I see this happening a lot with new and self-published/indie authors. The Rebel Christian has specialized in reviewing work from such authors for over 3 years now. Many times, I’ve said it before, and I’ll say it again; NEVER, I repeat, NEVER self-edit your story. I don’t know if this book was self-edited, but there are so many disruptive errors throughout the novel that I’m actually unsure if the editing or the writing is the problem. The plot and the characters, even the emotion, is all there. The book has all the right pieces but is unable to put them together properly because of poor writing or poor editing—I’m not sure which. There are run-on sentences, words left out or used in the wrong tense, and the narration gets jumpy at times. I truly cannot say the writing is bad, not at all, but the editing is so poor it might turn readers away. That being said, if you do stick it out with this book, you will enjoy the story hidden beneath all the errors. The plot is not bad at all and the characters are layered with development. There is beauty in this book, but you’ve got to be willing to find it. I do hope this author takes the time to give his work the attention it deserves because The Death Messenger has the potential to make it onto the favorites list of many readers. Although he is a new author, this was a great book to read. Suspenseful and always surprised me. The beginning of the book was a little depressing as to what was going on with the main character and I enjoyed reading how they defeated the devil. This was the first book for the series but I'm can't wait to download his next book to my Kindle, it was just that good!